Welcome back for part two of our blog post dedicated to Kate and Rob tying the knot. If you missed our last post of their rehearsal dinner at The CIA at Greystone, check it out here. For Kate and Rob, Beaulieu Garden served as the perfect setting for them to exchange vows, becoming man and wife amongst their loved ones. With the sun shining bright, their ceremony took place in the Sunken Garden. After sneaking away for a private moment in the surrounding vineyards, they celebrated with delicious food and wine below the terrace and then danced the night away under the stars. The florals for this wedding were a perfect combination of modern and romantic. We were particularly fond of the bright color palette they chose for their bridesmaids’ bouquets and the long stem tulip bouquet Radeff Design Studios designed for the bride herself. Chandeliers combined with green and pastel colored floral arrangements created a picturesque setting for dinner and toasts. Additionally, freestanding ivy-adorned topiaries and orbs flanked pathways and aisles, luring guests towards the terrace and fireplace lounge. Kate and Rob most definitely tied the knot in style! In the past few months, we’ve talked about your wedding gown, what your groom should wear, and some fun ideas for the guys, but now let’s talk about the ladies who will be standing next to you, your bridesmaids. With so many options, where does one start? We’ve got it all laid out for you, right here! Back in the day (we think sometime in those fashion-forward 80s…), the idea was that “the bridesmaids shouldn’t upstage the bride”, which left a whole lot of very unhappy bridesmaids in very ugly dresses that they would never ever wear again. This is ridiculous- there is no way that you, the gorgeous bride, can be upstaged by your closest friends. After all, they will be all over your wedding pictures, so your bridesmaids (and groomsmen) should reflect your wedding style, and why not make sure they’re comfortable while you’re at it? What voluptuous lady wants to be in a dress that is hugging all the wrong places? Or a petite girl that gets swallowed up by a thousand ruffles? Enough said, now let’s discuss some ideas. Of course, you can always have your bridesmaids wear the same dress, if you know that they’ll all be comfortable in it. You may consider a long versus cocktail length dress based on how formal or non-formal the overall wedding will be. You can also find similar dresses in the exact same fabric, but each is cut to suit the individual bridesmaid. This makes sure that each of your ladies is comfortable, and most importantly happy. There are several designers that got the hint and are making different style dresses out of the same fabric to make them look unique yet matching. One good place to check out is JCrew. Another similar option we love is this amazing “convertible” dress. Same dress just worn a bunch of different ways. With the versatility that your bridesmaids can get from this one dress, you KNOW that they’ll be excited to wear it again. If you select the same dress, maybe think about personalizing the shoes, while keeping them in the same color scheme. 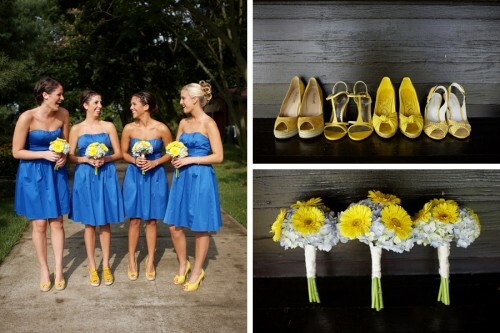 Or you can do the opposite: have your bridesmaids wear the same color dress (everyone’s got their favorite LBD!) and have them wear matching shoes (which could also be a great idea for your bridesmaids gifts). As you can see, your bridesmaids don’t all have to wear the same dress. In fact, they can even be completely different dresses, as long as they fit in with the style of your wedding and color palette . 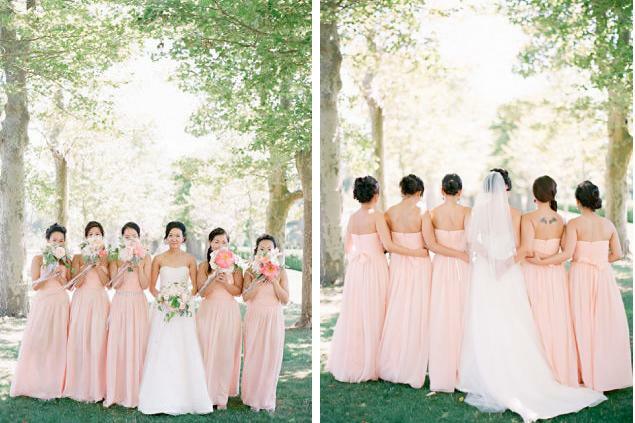 At her wedding, our friend, photographer Meg Perotti, had her bridesmaids select amazing vintage dresses in the same color scheme, but they fit each girl’s individual style. Check out her post to see how each of her bridesmaids were styled. Meg’s not the only bride that had fun with mix-matched dresses. Molly Sims gotta love her, and her gorgeous maids, donned floor length dresses. Each dress within Sim’s color palette, yet personalized to fit each girl’s style and comfort. Having the bridesmaid’s bouquets the same also helped to pull this look together. The three most important things to keep in mind when deciding what your bridesmaids should wear: your wedding style, comfort, style and body type of each of your bridesmaids. Have fun and see you next time! As wedding season quickly approaches, we thought we’d take advantage of this calm before the storm, and put together a little list of what we think will be the big trends of 2012. Just because we simply cannot wait until the end, we must start with the gowns. Yes, they’re just that good. PS be sure to check back later this month for our guide to finding THE dress. While we adore a pop of bright color, we’re predicting seeing more watercolor designs and soft shades, so pastels won’t just be on dresses. Going with the glam and romantic vibe, decadent and ethereal are the way to go for flowers. Soft, lush, earthy bouquets filled with flowers like cabbage roses, peonies, and wild roses, Queen Anne’s lace, dahlias, and gardenias. We’ve been seeing more and more “natural” and traditional photography. We agree: the panoramic wedding portrait of all your guests is a must! We are so incredibly lucky to live in an area with some of the most beautiful outdoor venues for the most perfect rustic-elegant weddings. Take some notes from the ritzy ranch wedding à la Lauren Bush and David Lauren’s recent nuptials on the famous Double RL Ranch. Check out some of their stunning details, here! We’ve said it before, and we’ll say it again: we’re foodies. We’re so excited to see (and taste!) some beautiful, innovative meals this year. These farm-fresh, organic options are the way to go, while crafted into photo-album- worthy presentations. A feast for the eyes and palate, check out our post about what’s cooking at Cavallo Point. Oh, this is going to be a great year!! 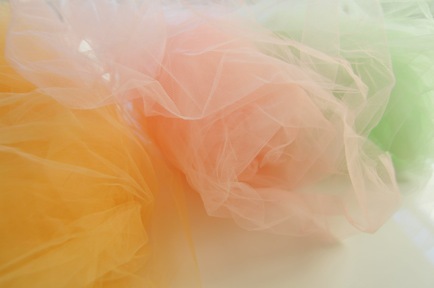 I have to admit: I have a crazed obsession with tulle. Don’t worry – I am not saying that I wear it on a daily basis, but you would be alarmed by how many colorful (costume!) tutus I have in my closet (as were most of my friends when I began pulling them out a few months ago). So, when I saw this amazing picture on Cupcakes and Cashmere I fell in love and I knew I had to share it! 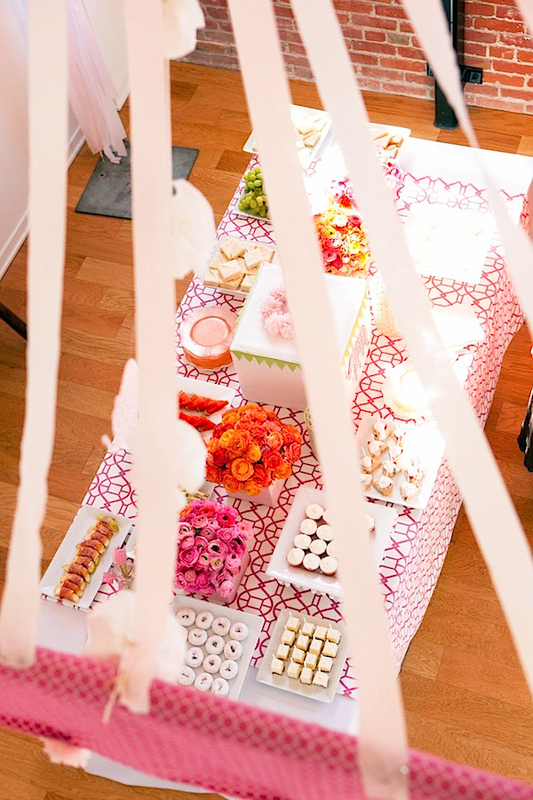 The colors are amazing and so inspiring for an Easter fête! Enjoy!